In “Let This Mother Out,” Charmed makes its Monster Of The Week deeply personal. An imposter demon that looks like their mother emerges from the Book Of Shadows and nearly tricks the sisters into giving up their powers, using the lethal weapon that imposter demons possess: emotional manipulation. The central twist is plainly predictable, but that’s alright in this case. It ends up being alright that there isn’t much room for belief that this could really be the girls’ mother, because the characters so convincingly believe it. Or, at least, want to believe it. Mel’s desperation is particularly palpable, and Macy pushes back on her stubbornness, but her efforts are futile. Mel wants so badly for her mother to be back that she ignores all signs. So, of course, it has to be her to make the climatic choice at episode’s end. So even though it’s clear that a demon is messing with the sisters via the spirit board and it’s also clear that Harry really is trustworthy, the episode still works. Instead of being driven by suspense, it’s actually very real about how green these witches are. They’re in over their heads, and they’re driven by impulses and emotions, because at the end of the day, they’re just normal girls who have lost their mom—who just happen to be witches. “This demon business we do, it can take its toll on one’s emotions,” Harry tells the sisters near the end. It’s this acknowledgement of the psychological toll that their witchcraft takes that adds something a little more nuanced and meaningful to the otherwise formulaic Monster Of The Week episodic structure. Mel is, in the end, forced to stab a demon that looks exactly like her mother. And Charmed thankfully doesn’t downplay the emotional stakes of that. “Let This Mother Out” also does a solid job of portraying the divergent ways that Mel/Maggie and Macy mourn their mother’s death. There’s some tension there, especially between Mel and Macy because of Macy moving into their mother’s old room. Macy has so many unanswered questions and feelings of abandonment. And for the brief moment when she thinks she has her chance to ask her questions, she seizes the opportunity. It’s devastating. 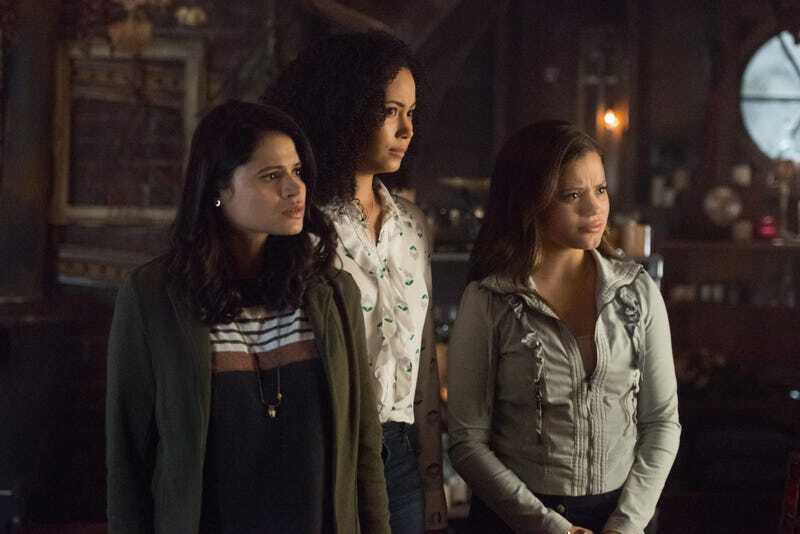 But Charmed makes it clear that despite the fact that she’s an ultra-powerful witch, Macy might not ever have the answers to the questions she seeks. They can freeze time, telekinetically move things, and read minds, but they can’t circumvent grief and loss. Magic doesn’t provide an easy way out for their pain. But while the dramatic beats of this episode—especially as they pertain to mother/daughter dynamics—are great, it also delivers on the humor front. Magical mishaps were always a fun part of the original Charmed, and a truth serum switch-up here leads to Nico spilling her guts to her coworkers and Mel. Ellen Tamaki is so fun in these scenes, her hurried delivery endearing and hilarious. So far the drama that has come up between Mel and Nico has felt very grounded, and even though we haven’t spent much time with them, their relationship dynamic comes through very clearly. And while the relationships between the sisters are the best parts of the show so far, the little ways that Charmed has opened things up to explore other interpersonal parts of their lives show a lot of potential for strong character work and longer arcs. The real story behind their mother’s death remains at the forefront of the mythology, driving the literally apocalyptic stakes of the season. But it’s the emotional investment in learning the truth that makes the stakes so much higher. The mystery persists, but there’s unresolved trauma for all three sisters, too. And Charmed keeps those emotional underpinnings in play amid all the witchy shenanigans. The sisters deciding to call Harry “Meghan Markle” to avoid summoning him gets funnier and funnier as the episode goes on. I recently binged The Haunting Of Hill House, so I was very excited to see Maggie put on those gloves in hopes they would dampen her powers à la Theodora. But it doesn’t end up working for her. Instead, the secret to turning off her abilities is fully trusting her own voice. I’m actually very charmed by the on-the-nose ways this show makes it clear that it’s set in current times, from the political references to the details like Maggie using her selfie cam to vanquish the demon. Charmed isn’t taking itself too seriously a lot of the time, yielding a lot of campy fun.